Elzbieta is absolutely correct that the Diocese is Lwow or currently Lviv in what is now Ukraine but in 1927 was part of the Republic of Poland and in 1897 was part of the Austrian Partition. The deanery in Latin is Kizliviensis which translates as Kizliw which I believe is currently named Kozliv. Names of cities, towns and villages often (but not always) are simply the name of the place in the vernacular with the adjectival ending iensis. The archdiocese of the place where I grew up, the Archdiocese of Chicago, has the Latin name "Chicagiensis". A parish and a village in Poland where my ancestors lived would be the parish of Slupy which is rendered in Latin Slupiensis and the village of Jarogniewice which is rendered in Latin as Jarognieviensis. Since the Latin alphabet does not use the letter "w" any Polish place spelled with a w in Latin substitutes v for the w. As you can see from these examples, if you drop the iensis from the Latin form it is not too difficult to guess the name of the place in the vernacular---especially if you are familiar with the area and the vernacular language. If you notice on the top left of the certificate appears Respublica Polonia=the Republic of Poland=Rzeczpostpolita Polska. The next line is Ducatus which in this case is the Wojewodztwo. However, the entry is left blank. The following line is Districtus which is a name beginning with a G. However, most of the name is covered by an official stamp and seal. Districtus in this case refers to the gmina. As far as I am able to read the surname, I believe that Wawrlw is what is written. This seems to me to be a Polish form of a Ukrainian surname. The person baptized does have the first name of Mikolaj in Polish. His father is Joseph (Jozef) and his paternal grandparents are Michal & Anna nee Nima (?). The note under the column listing the parents continues into the column for the sponsors and reads "agricolae loci" or farmers of this place, i.e. Taurov (Taurow) and refers to the parents, grandparents, and sponsors. Since this is a certificate and not a photocopy of the actual record book, the long Latin sentence is simply stating that to who it may concern, this is a faithful transcription of the original record. Here the priest did not enter the volume, page and number of the record although there are blanks where this information should have been entered. Finally, you notice that this certificate is not only a record of Mikolaj's birth and baptism, but also of his confirmation (and communion). The Eastern Rite Catholics follow the Orthodox custom doing all three of what are called the "Sacraments of Initiation" at the same time. The child is baptized, given Communion by placing a drop of sacramental wine in his/her mouth and then confirming the infant. In a separate post I will post information about what is a deanery (dekanat) in the present Catholic Code of Canon Law (Codex Juris Canonici) as well in the 1917 Code which was in force at the time this certificate was issued. Many thanks Dave - with your information I could find Kozliv or Kozliw or actualy Kozłów (writing with Polish diacritics). Then digging more I found a list of parishes, which has been dismantled by Russians in 1945, in three diocesis: Vilno, Lwow and Luck. Altogether 389 parishes in Lwow diocesis, including Kozłów in 1938 (middle column). Thanks for your responses. I did some more research after my post and found out some Wawrow arriving at Ellis Island. Two of them were from Taurow, so now I am seriously thinking this should be the correct spelling. There are descendants of him still living and I will try to reach some of them. The item number is #30 for Franciscus Piela. The information in the major column provides information about the groom in several subdivisions. The next major column refers to the bride in several subdivisions. The notation deals with the legal elements of the wedding. In Latin: The consent of the father of the bride having been received (and the in Polish a statement of the father's consent): "I Walenty Chrupcala grant permission to my daughter to enter into the bonds of marriage with Franciszek Piela and sign in testimony to this." His mark X follows with his name. It appears that he could not write so either he made his mark in the record or the priest did it for him. The note continues in Latin: And after having seen the permission from the civil authorities (the information of the civil marriage license/permission follows) Lezajsk 21/6 877 Number 5657 Franciszek Nicolek (name of priest) blessed the marriage. Thank you for the translation and explanations. influenza. She came to the USA and lived and died between the 1910 and 1920 census - no census records on her could be made. script was scribbled) and Grodizsko as her birthplace. The translation you provided provides a lot of information to follow up on and ends for now a dry spell in the search. Regards item 1 - abbreviation under house number 234. Oppidum Grodizsko; et pagi: Grodzisko dolne et gorne. entry. (skan: 128:jpg - at the top of the page is an example). being for the groom and second for the bride. I suggest the same applies to the dual house numbers. The abbreviations this priest uses are something he devised himself. I believe the abbreviation under the house number is for the village where the house was located. The first abbreviation after the groom's name is agr = agricola (farmer). the second is fil. = filius (the son), the third appears to be pd. and is something the priest devised himself to indicate that the person who follows is deceased so the d probably stands for some form of defunctus (deceased). I'm not sure what he intends to convey by the p. If you look at other entries on that page and on the following page that abbreviation appears very frequently which would not be surprising since a number of the brides or grooms are widows or widowers and are older. In marriage #31 the abbreviation changes to ppd before the name of the deceased wife of the widower groom and then reverts to pd before the names of his parents. The bride in that entry is one of the few principal parties with both parents still living. You are correct that when there are two house numbers the first is for the groom and the second for the bride. Also, you mention that your grandmother was not in the USA for the 1910 Census and was deceased before the 1920 Census. A possible source of information about where your grandparents would be microfilms of Chicago City Directories. Your grandmother will not be listed by name but perhaps your grandfather will appear in a directory. The only other information usually contained in directory entries is the occupation of the person listed. Many thanks to both. That helps a little with Latin. Actually, when trying to learn, I found interesting French pages with Latin used in genealogy (words but also sentences), and translated to French. I sincerely would appreciate translating this baptism record for Valentine Kamyszek, from Milawa. 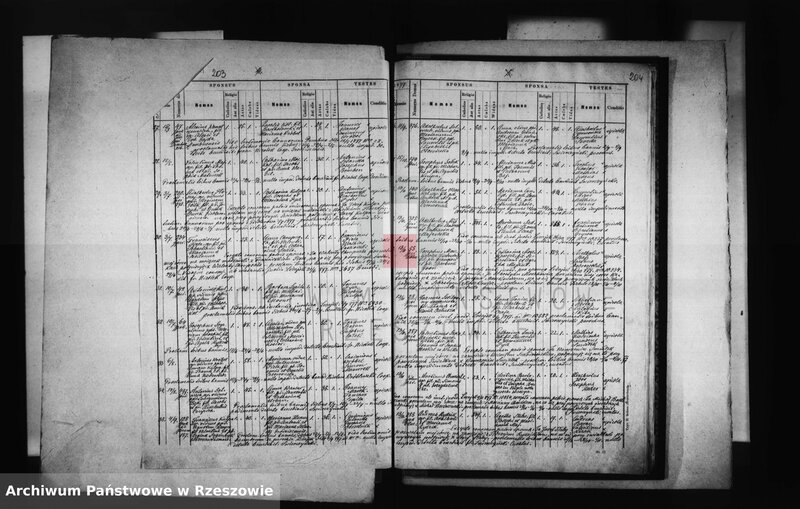 I would sincerely appreciate translating this marriage record of Valentine Kamyszek and Magdelena Zychlinska. I left it here to remind me “Errare humanum est, perseverare diabolicum”. Thank you for being indulgently silent. Here is what I can deduce, and how I did. To be corrected if necessary. I decipher Kamyczek (with "c"), which is a Polish name for a tiny pebble. Year 1820, day 2 February, I, [priest] mentioned above, baptized a boy born on 30 January at 2 pm, who was declared by the witness Felix Lubaniczew, baby of Mathias and Marianna born Sieszerk, spouses Kamyczek, peasants in [cannot decipher], to whom was given a name of Walenty [Valentine], were present Lubaniczew Felix, Kamyczek, and Marianna Selnicka, all peasants from Miława. Til? Fel?… Lub… (witness first and last name) => below Felix Lubaniczew? I would appreciate it very much your help with this death record in Latin. The village is Trzciniec, in 1851. The figures on the left side (17, 11-16, N13) make me think three deaths were recorded together. All deaths occurred on the same day? I can read "burial of Antoni Cieslinski" and some lines after it mentions Rozalia and then Laur(entius). Rozalia and Laurentius (Magrowski) were husband and wife. Did both of them die on the same day? The same for this one. I do hope Dave will complete and correct. 26 January 1848, celebrated by priest [cannot decipher]. Blessed marriage between laborer Walenty [Valentine] Kamyczek, young man from Milawa and Magdalena Zychlińska young woman from Słowikowo, before [cannot decipher] mother; no objection to marriage occurred. [in next column] Both children were under the authority [powers] of the mother Spunza? ambo liberi spunza sub potestates matrio = both children were under the powers of the mother Spunza ?